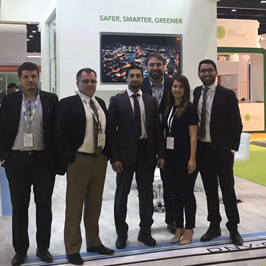 GreenPowerMonitor joined DNV GL at World Future Energy Summit (WFES) this year. It was a real pleasure to join our DNV GL colleagues at the event, which is part of Abu Dhabi Sustainability Week and one of the world’s most influential event dedicated to advancing the use of renewable energy, energy efficiency and clean technology. All visitors had the chance to meet DNV GL energy experts as well as GreenPowerMonitor solar and monitoring experts at stand 6216 where they were welcomed to discuss and demonstrate the value our solutions can add to their PV assets through GPM controls, performance monitoring, portfolio management and O&M tools. During the summit our CEO Juan Carlos Arévalo engaged in a private event organized by DNV GL where he introduce GPM’s managing solutions especially focused on SCADA solutions and Power Plant Controller.